The ultimate slogan t shirt that will set you back a mere £345. I may have “accidentally” made a rather bouji purchase. £345 on a t shirt is pretty outrageous I totally agree with you. But when you wake up on a Friday morning having just been paid and this baby pops up on Net-A-Porters new in page. There’s only one thing to do right?!? So we understand now that it was the circumstances that led me to own this rather ridiculously priced Gucci T Shirt. Plus I had an enthusiastic Fiance egging me on – like a typical man once I actually made the purchase he went on to say “I can’t believe you actually bought it” ok thanks for that. But do you know what. I’d do it again, and I might just. You see, since I bought it I literally haven’t stopped wearing it. I mean it’s a t shirt it goes with everything and it just takes every outfit up a notch. I’m actually doing a styling video on it on Thursday so make sure you subscribe to my Youtube Channel if you haven’t already! So much so that I actually have considered the all black version in a sweatshirt or another Gucci T shirt. 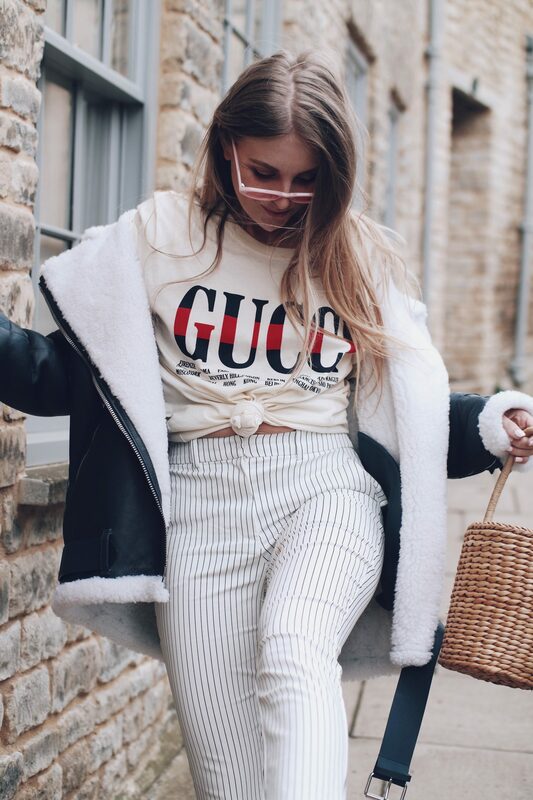 How many Gucci T Shirts is too many? I’ve also been eying up this Saint Laurent one. I guess once you pop you can’t stop. The thing is, when you make a designer purchase like a handbag or some shoes, you always think about the cost per wear. So when it comes to a t shirt which you will be wearing a lot. The cost per wear seems pretty reasonable and it’s these kinds of ways of thinking that will find you with a Gucci T shirt in your shopping basket. Like one of my lovely instagram friends pointed out to me, it’s better to invest in your day to day wardrobe, the things you wear all of the time, than one off pieces for special occasions, and quite frankly I couldn’t agree more. I actually adore this outfit so much. Originally I was wearing it with jeans which did look good. But then I went to the H&M showroom and tried on these trousers. You could say it was love at first sight, I kept them on for the rest of the day, they looked so much better with my outfit! 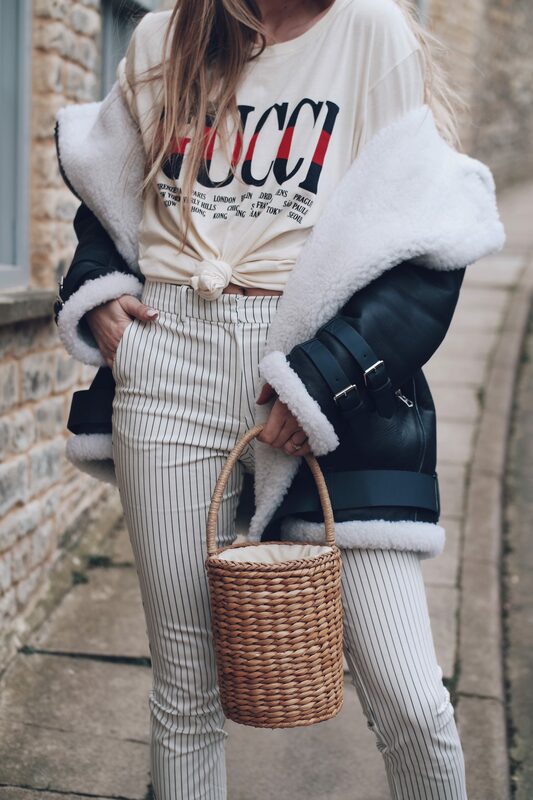 I love the clash of the cream Gucci T Shirt with the white trousers and I have a feeling these trousers are going to be my summer go-to pair. They’re so comfortable and easy to wear! 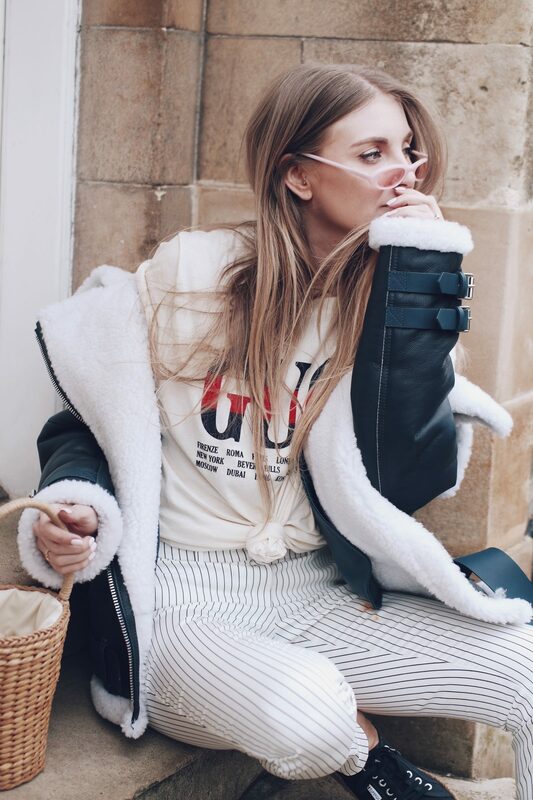 I think the combination of the Acne coat and the basket bag is pretty confusing but I do like it. 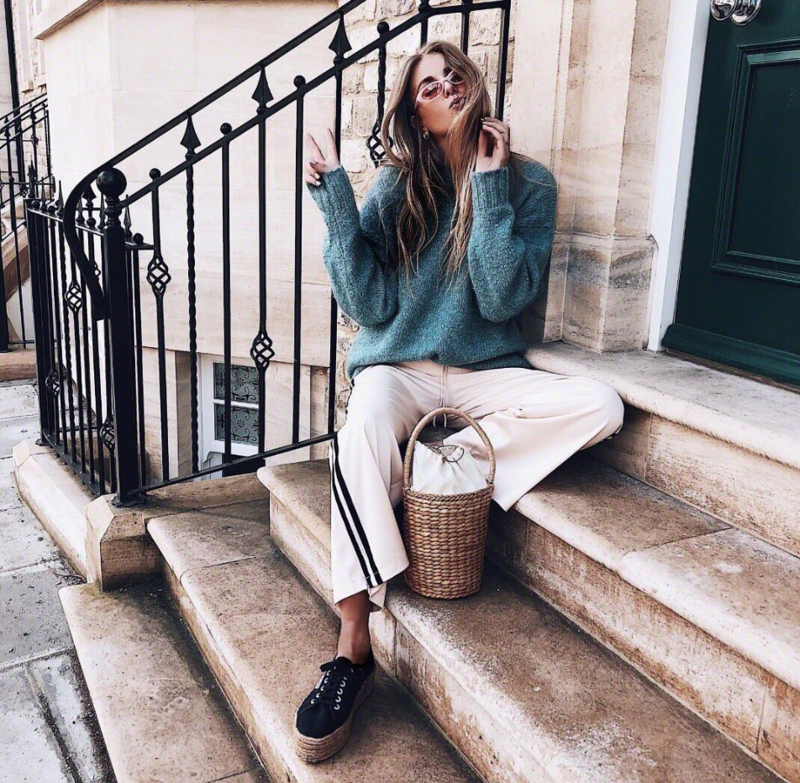 I love different textures in an outfit so this is right up my street (funny because this is actually shot on my street. so it genuinely is right up my street). 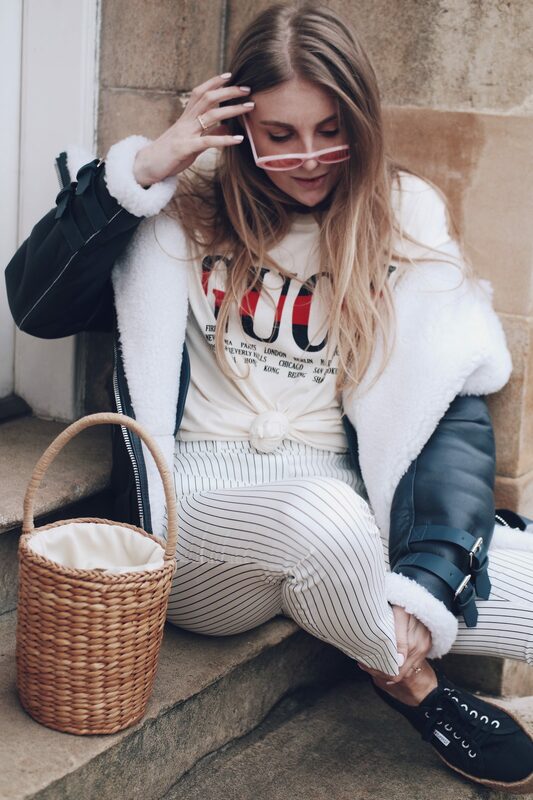 I know I got this coat from Bicester Village and it was such a score because I’ve never seen this coat in this colour way before, usually it’s always in the black so I was happy to find something a bit different, but I did find it online here too guys! So if you too are feeling bouji you can pick yourself one up! If not I also found this super affordable one which is so so similar and on sale! For the Gucci T Shirt I went for a size small as my friend who already has one advised me that they’re pretty oversized anyway. As an 8/10 I would ordinarily have gone for a medium for this effect but small was perfect! Also I know there’s people looking at this and thinking the same as what my sister and Fiance said, “I can’t believe you knotted a £345 t shirt” but it’s super cute like this no? Also, one last thing! How cute are my new sunglasses from Chimi eyewear?! You should check out their website they have so many amazing pairs I think I just found my new favourite sunglasses stop! £345?! Ouch! But to be honest I’m such a sucker for those sort of luxury items too lol! 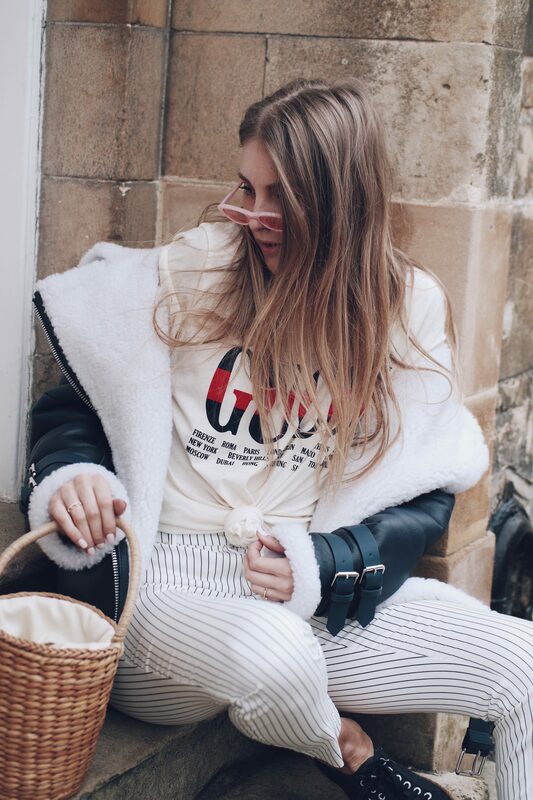 When the first Gucci t-shirt came out I was so so obsessed but in the end I didn’t get it and regretted it, so I’m so glad they’ve brought the slogan tees back in slightly different variations! Loving this outfit! I totally felt the same! Literally the same amount landed in my bank account and I had that friday feeling, it was madness!